I recently returned from a journey through Borneo and Sumatra in part with Linking Awareness Adventures. If ever you had an interest in experiential training around the idea of expanding your perspective and perception, do check out what they're up to! I often have vivid dreams, and they've really been catching my attention the last few months. I'm always taken with the landscapes in them and they often reflect places I've been or sometimes even show up in my waking life after the fact. This trip was no exception! I dreamed a few years ago a long and intense dream that picked up where I left off 3 nights in a row (never happened before or since quite like that). I'll spare you the tedious details of the dreams themselves, but at the end of it all I was walking along a misty green mountainous ridge dotted with little odd buildings, winding my way up a mountain to a hospital. Now, the hospital I dreamed about actually showed up last year while doing some outreach work at a hospital in Malang, Indonesia. But the path! The image of the path has been burned in to my brain ever since that dream. 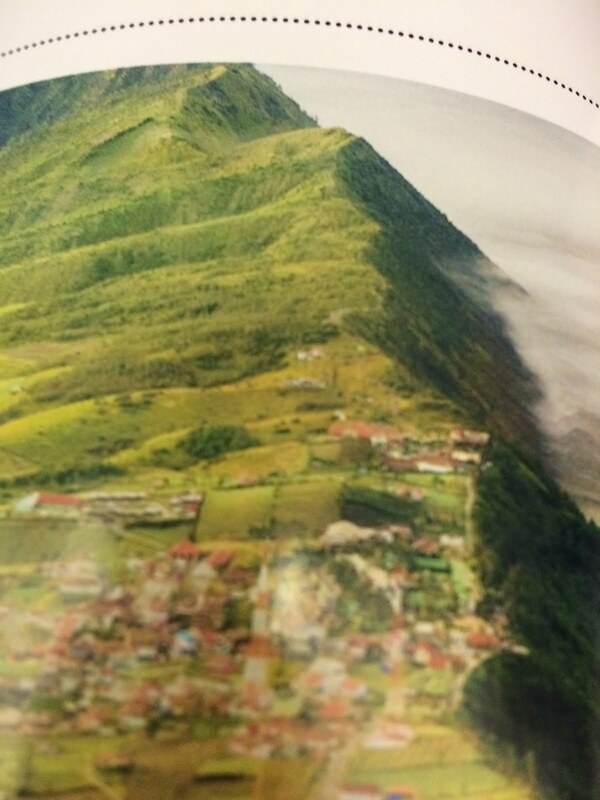 While waiting to recline on an internal flight from Sumatra to Jakarta this year, I happened to pick up the in-flight magazine and flip through the tourism ads... Lo and behold, in a full page image, there was the path I had wandered up in my dream years before. Mount Bromo, the famous volcano in the Sea of Sand in Eastern Java. The year before, we had tried to arrange a trip up there but nobody was motivated enough so it didn't happen. I'm all for laughing things like this off but this isn't a similarity or resemblance, this is to an absolute 'T' the place I wandered through in that memorable vision. Naturally, a picture of the ad was necessary! What made this all the more interesting was what happened on my way home this year. I had 12 hours to kill before my international flight from Jakarta, so I checked in to a nearby budget hotel. The man at the desk looked vaguely familiar. There was quite a language barrier, but we worked out that he was on vacation in the same resort I was at last year in Malang and remembered my face. Great! We shook hands and smiled about it all, and I turned around and picked up my bags to hit the elevator up to my room. He asked as I was walking away, "Have you been to Mt. Bromo?" I turned around wide-eyed and explained that I hadn't been, and asked why he had asked... He shrugged and said "I don't know!" Some probably don't put as much stock in their dreams and I have a feeling that I have a lot more that are easily forgotten and discounted throughout any given day. To me, this speaks to an idea (of course, coming from another dream) that there is common ground in our dreamscapes. It's entirely possible that I saw a similar image at some point and it just happened to sit in the back of my subconscious, but certainly the inner sanctum of the hospital I wound up actually walking in to wasn't acquired from some fragmented image. I'm big on symbolism and personal messages, and whether it's subconsciously generated or not I don't think it becomes any less relevant to one's self. The more I encourage and allow myself to dream freely, the more difficult it seems to become at times to separate the waking world from what I've already seen. I'm in the process of attempting to clarify my dreams in order to see if there's something productive to be done there. I'm often doing a lot of footwork all night long and wake up just as exhausted and sore as I would be in the waking world, so I have a keen interest in trying to rope that in a little bit to see what's possible. I think that perhaps I might have to take a waking visit back to that volcano, just to see. I wouldn't be too surprised to find there were someone or something waiting up there for me!